The first thing any pilot using the Betaflight firmware should learn is how to do a settings backup. For ARF quadcopters, this is critical to capture any important settings changes the manufacturers have made over the Betaflight defaults to get the quadcopter to fly. It is also a good idea to do a backup any time you install a Betaflight update. These updates sometimes wipe your settings, so a backup will be your only way to recover your quadcopter to the way it was flying before. It can also save you hours of frustration attempting to figure out what setting changes caused unwanted flight behavior. DO NOT RELY ON THESE BUTTONS! For this reason, the best way to back-up and restore Betaflight settings is using the CLI tab. Don’t worry – it’s not too difficult! Generating a backup using the CLI has been made simple. 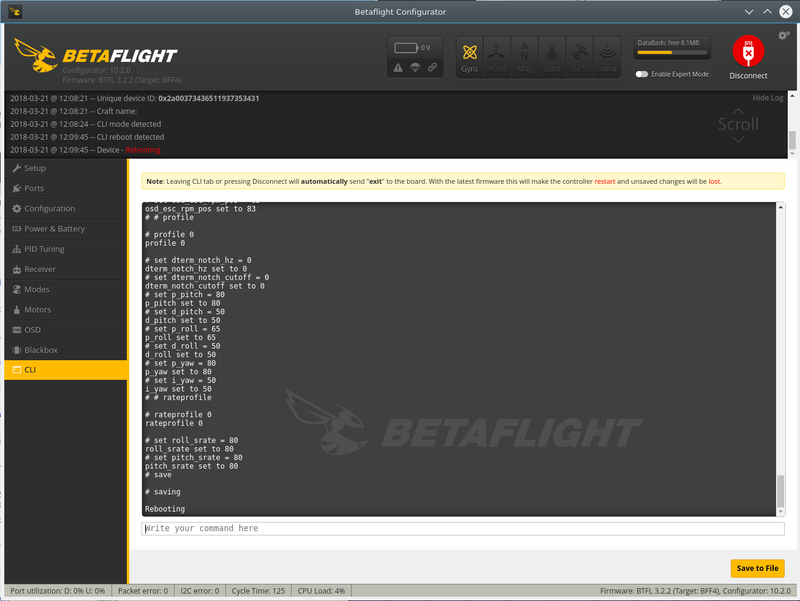 Go to the “CLI” tab of Betaflight Configurator and type your command (generally “diff” — described in more detail below). Hit Enter and you should see a wall of text getting outputted in the console. Click “Save to file” to save your backup. There are two commands you can use to backup Betaflight: diff and dump. For most users, we recommend you use diff. Both commands are described below. 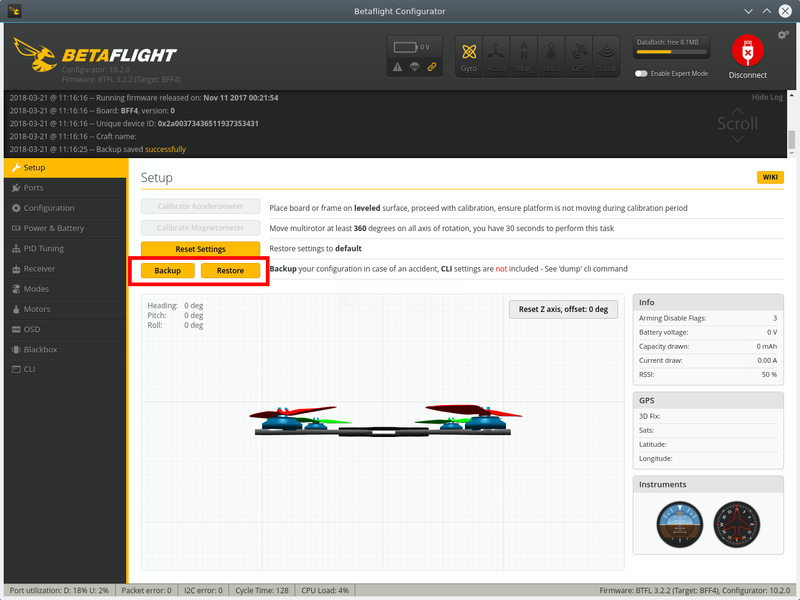 The diff command looks at all of the possible Betaflight settings and compares them with the default settings for your flight controller. It will only print the settings that have changed to the console. This makes for a nice, small output file that is easy to audit if/when it comes time to use it for a restore. It is also often much easier to use when you are looking for settings that may be causing trouble. The dump command is the hail-mary of backups. It simply prints out every possible Betaflight setting and what value is assigned to it. We don’t like it for backups because some settings are intentionally changed by the developers between Betaflight releases. If you only backup and restore CLI dumps, you won’t be getting these changes. At best, this will make your quadcopter miss out on a cool new feature or improvement – at worst, it won’t fly at all. Dump is useful for some things, though. If your quadcopter was working in Betaflight 3.2 but stopped working in 3.3, you can find out what settings the developers changed which may have caused that using the dump command. It is also useful for finding a particular setting when you don’t know its name. CLI backups must be restored using the CLI. This process is described below, but first you must understand some of the caveats of restoring a backup. Audit Your Backup Files Before You Restore! Depending on what your intent is, you may not want to restore every single setting you backed up. 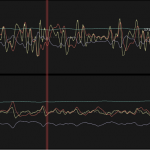 For example, if you updated your Betaflight firmware to a new version, changes to the PID algorithm and software filters may mean that it’s a good idea to start at the default PID settings and re-tune your quadcopter. Similarly, the way RC rates work occasionally changes, and you may want to review your own rates. On the other hand, if you are restoring Betaflight to the exact configuration it was previously working in, you should just do a blanket-restore of all settings. 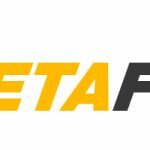 Just make sure you are using the same version of Betaflight. The version will be in the top of your back-up file. To audit which features you restore, go through the backup file using a text editor. Take a good look at each feature and try to figure out how/why it was changed. Descriptions for most settings can be found with a quick Google search. 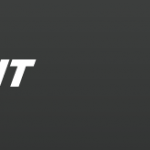 As was mentioned above, consider removing any changes to the PID or filter settings when doing a restore on a new version of Betaflight – chances are you are going to need to re-tune your quadcopter anyways: you might as well start somewhere that worked well for the developers. This will automatically reboot the flight controller and send you back to the home screen. Browse through the various set-up tabs to verify that all your settings were restored.